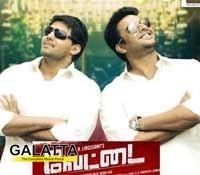 While Kollywood's sensational hit Vettai, starring Arya, Madhavan, Sameera Reddy and Amala Paul, is heading towards 100 days in Tamil Nadu, reports said that the film will soon dubbed and released in Telugu as Bhale Tammudu. This action based family entertainer, which also won critical acclaim for its gripping screenplay by senior director Linguswamy, revolves around two brothers. Dhanunjai and S.P. Shiva Prasad of UTV Motion Pictures said that the dubbing work is progressing and the film will hit the screens soon. Yuvanshankar Raja has composed the music and songs are expected to release in third week of this month.